Last year saw the anounncemt of Ludens 1/6 scale figure by Kojima Productions x 1000toys! As photos and prototypes surfaced, collectors and us already hustling up funds to get ready to own this bad boy. Over the past year, we’ve had the teasers and lovely set of WIP photos to drool over for Kojima Productions company icon “Ludens” produced by the mighty 1000toys into a one-sixth scale high-end action figure! Already been on display at NYCC 2017 as well as Wonder Festival (summer) its time for us to trade in the wives, sell whatever we can for this amazing Ludens figure. “One design point of pride is that the EVA Creative Suit will be completely seamless with no visible joints – giving the final piece a massive and heavy presence to top it off, built-in light-up functions and moving eyes combined”. Today Sentinel co Ltd (株式会社千値練) released more updated photos of Ludens which gives you a closer look as Ludens comes ever so close to landing. 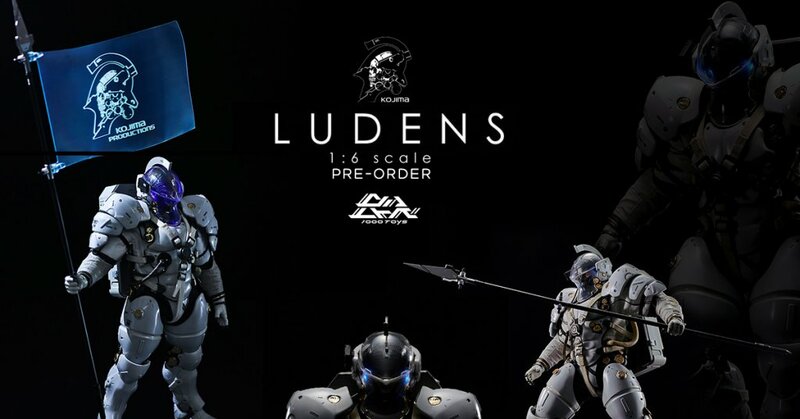 By using an inner frame designed specifically for this product, Ludens features 46 points of articulation including click joints which allows a high range of motion for various action poses. Based on the innovative design by Yoji Shinkawa and fully supervised by Kojima Productions, the base figure comes in large at a whopping 31cm (12.2 inches). The EVA (extra-vehicular activity) Creative Suit is recreated using ABS, PVC and real cloth. The figure comes with features such as built-in light-up functions and moving eyes combined with the detailed painting to form a high quality 1/6 scale action figure. Also included with the Ludens figure are 2 detachable helmet visors. The dark smoke visor gives Ludens a darker mysterious look. The clear type visor shows off the incredible details inside the helmet. Inside the helmet is a perfect recreation of the face as seen in the teaser movie and production art released by Kojima Productions. The skull-shaped face mask has also been faithfully reproduced following the original design. Ludens comes with a lance incorporating the sharp design of the original art and can be held by the figure. Yes! The wait is over!! The 1000toys produced 1/6 scale action figure of Ludens – “the icon character” for Kojima Productions – is now available for pre-order! The included beam flag is made from a clear material with a crisp pad printed logo faithfully replicating the version seen in the promotional movie. Mine is on it way!!!!! Cant freaking wait and this review definitely have me more stoked. Does 1000toys ever restock or reissue? Late to the party is putting it lightly! No, I don’t think so. However, there are Facebook groups of 1000toy collectors that maybe able to help you get your hands on items that have long since sold out. Search 1000toys in FB and see what comes up.